1. Whirly Pop popcorn popper — Jay bought me this for Christmas, and we just got around to using it. I can't believe we waited this long! The first time we used it, we gave each other this look like, "We have found the holy grail of popcorn, amen." We used the theatre popcorn kit and it's like Disneyland popcorn in your own home. Yes, please. 2. Almay Smart Shade concealer — I picked this up because I was in need of a new concealer to use under my eyes. I only got this specific brand because I figured out how to get it for less than $2 (yay, coupons!) which was such a deal. Now I'm glad I went with it, because it works great! I love how smooth it is, especially since I'm using it on the delicate skin under my eyes. 3. moon print by Old English Co. — I just love it. So simple and perfect. 4. Let's Pretend This Never Happened by Jenny Lawson — This book made me laugh so hard I cried. Typically, when a book has a gratuitous amount of harsh language it turns me off (I find it too distracting, and almost contrived), but for some reason it didn't bug me in this memoir. There's something about Jenny's storytelling that is so genuine and endearing, and I found myself wanting to reread the book right after I finished it. 6. Lennon and Maisy Stella — Oh, these two. They sing to my soul. Their harmonies are absolutely unreal. I first discovered these sisters via YouTube and was so excited to hear they did a cover of The Lumineers' "Ho Hey". And it is so good. You can listen to and download some of their YouTube sessions here (I recommend "I Won't Give Up"; makes me cry every time) and their version of "Ho Hey" here. And what is making you swoon this month? I am also blown away by Lennon & Maisy. Such raw talent! I don't really like country, but their cover of Ring of Fire is sooo pretty! 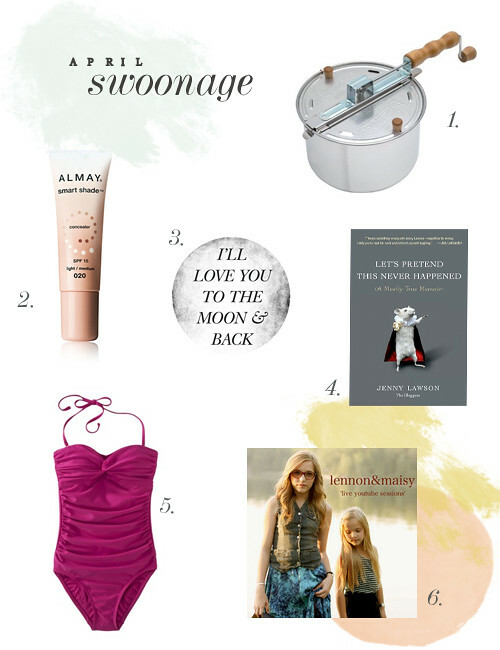 I love your swoonage posts! Do you watch "Nashville"? Lennon & Maisy are in it. I heard their cover of "Ho Hey" there. The show isn't that great, but I'm a total TV junkie, so I watch almost everything under the sun. Anyways, yes, they are really great! I was pretty sure they lip synced with someone else, but I didn't know they are real life singers. Now, I'm pretty much blown away by their talent. That books has been on my to-read list. Waiting for the library to get a copy. That could be a while, eh? There are coupons on Target's website! Mind blown, right? I had no idea until I started reading couponing blogs. AND you can stack one manufacturer coupon with one Target coupon for extra savings. I bought a razor pack this week and used a $4 manufacturer coupon with a $3 Target coupon and got the pack for only $2! Amazing. I also love that the Target coupons are for things like $5 off a pair of shoes or 20% off swimwear, etc. I have that swimsuit in black! Love it. Love Nashville and L&M are so cute! I'm adding the book to my nook for my trip to TN next month. Have you read "I Was Told There'd Be Cake?" Hi! Newcomer here :) What a friendly and welcoming blog and layout! I hope to stay awhile. I'm currently expecting (25 weeks along) and I just ordered an Old Navy swimming suit with white polka dots. I will surely be soaking myself up in water, since I'm lucky enough to be pregnant all through the upcoming summer. Sarcasssssmmmm. Aw, thanks for reading and for leaving a comment! :) Congrats on your pregnancy! I hear you on being pregnant in the summer. Eisley was born in August, so I went through the whole "super pregnant in a bikini" thing. My favorite moment was a few weeks before I gave birth, when my best friend's brother joined us at the beach and said, "Your ankles are so…pregnant." Love me some of those Maisy sisters! I found them on Youtube over a year ago and now they're on that show Nashville! Love em! They're so crazy talented! Im gonna have to look into that book! I don't know if you remember me or not, but we worked together at Disney (it feels like a million years ago). I somehow stumbled upon your blog and I really do enjoy it. You have a nice way with words and I really appreciate when people have that quality.